The game started with the four armies in each of the four corners, in a double row, like Chess, the four main pieces behind the four pawns. Other than the fact that it was a game for four players, the other main difference was the use of dice to decide which piece moved each turn. 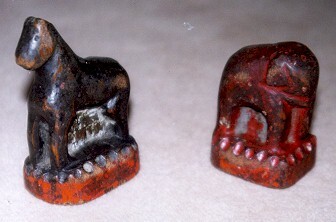 Under Hindu law, gambling became forbidden early on in the Hindu civilisation and, to avoid the gambling laws, Shaturanga players dispensed with the dice. Another early modification was the merging of the allied armies into a single army making the game a two player form and duplicating the pieces, both developments which have survived until today. Other changes also occurred; the two Rajahs were demoted to Prime Ministers in the change to the two player form and their movement reduced making them much weaker while the moves of the Elephant and the Ship were swapped around. The resulting game was called Shatranj. The first reference to Shatranj occurs in a Persian book written around 600 AD which says that a Hind ambassador came to Persia from India during the reign of Naushirawan (Chosroes I, 531 - 579 AD) and presented the game to him as one of several gifts with a challenge to learn its secrets. By 650 AD, the game had reached the Arab kingdoms and had also reached the Byzantine Court by virtue of the fact that the grandson of Chosroes I married the daughter of the Byzantine Emperor Maurice. Its also reached Greece, Mecca and Medina around the same time. There are three versions of the story of arrival of Shatranj in Europe. One says that the Saracens brought it into Spain when they settled in Analusia following their conquest of North Africa in the seventh century. From there the game may have travelled eventually to France and the court of Charlemagne around 760 AD. A second claims that Charlemagne and the Empress Irene of the Byzantine court at one point were contemplating marriage. During their meetings one of the presents exchanged was a Shatranj set given to Charlemagne. 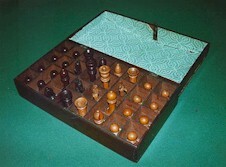 Unfortunately, instead of two Prime Ministers, the set contained two Queens with enhanced powers, making them the most powerful pieces on the board. Charlemagne thought this was not a promising sign and decided that the marriage wasn't such a good idea after all! The most popular theory, however, is that the Knights of the Cross obtained the game from Arab lands during the Crusades. It is known that Shatranj was held in some esteem at the court of Saladin, who created the Ayubite dynasty in Egypt and Syria and the Christians certainly obtained medical secrets from physicians in this dynasty. Prime Minister (Firz) - moved one square diagonally only. Elephant (Fil) - moved two squares diagonally only but could jump over intervening pieces. Over the next four centuries, the game stayed in much the same form as above - the European form of medieval Chess described in Caxton's 'The Game and Playe of Chesse' wasn't much different to the Persian form that the Crusaders probably discovered. As time progressed a variety of exotic variations came about in forms such as Circular Chess and The Courier Game which was a kind of extended Chess played on a board of 12 x 8 chequered squares. At about the same time that Shatranj entered Europe, it was also heading Eastwards back through North India and into Burma, China and Japan. The games Sittuyin (Burmese Chess), Mak-ruk (Siamese Chess), Shiang K'i (Chinese Chess), Korean Chess and Sho-gi (Japanese Chess or The General's Game) are the resultant modern forms; Chinese and Japanese Chess join Modern European Chess as being the primary modern day forms of Shatranj. Chinese Chess or Shiang-Chi or Siang K'i is a considerably modified form of Shatranj, the first reference of which has been found in a book called 'The Book of Marvels' by Nui Seng-ju who died in 847 AD. 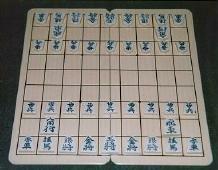 The pieces are simple disks with Chinese characters on them to differentiate and are played on the points of the board rather than within the squares. 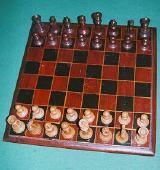 The un-chequered board consists of 10 x 9 points with two notable distinguishing features. Firstly, dividing the players in the middle is the 'River', an open area. Also, each player has an area of 9 points in the middle at the nearest edge called the 'Fortress'. This board is a cheap one bought in London by the author. The General - moves orthogonally one space but cannot move outside the Fortress or such that the opposing general is on the same file with no men between the two. The Elephants - move two points diagonally but cannot jump over intervening pieces and cannot cross the River. In Xiang Qi, the concept of Stalemate does not exist. If a player cannot move, that player has lost which serves to remove one of the more tedious aspects found in the European game. 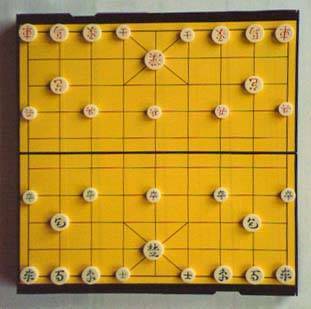 It is often quoted that Xiang Qi is the most popular game in the world which is true but this is, of course, largely due to China's great population (European Chess is more ubiquitous but Europeans should not be smug about this either since it has little to do with the qualities of the game and everything to do with European military and political dominance during the latter half of the second millenium AD). Japanese Chess or Shogi or Sho-gi or "The Generals Game" has a major innovation over other games in the Chess family: Pieces when taken are allowed back onto the board. This has the advantage of making draws quite unusual and thus, some would say, a more interesting contest. 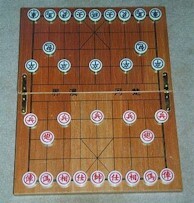 The pieces are pointed wooden counters with Japanese symbols on them, both players having identical sets, orientation being the method of determining which piece belongs to which player. The board is unchequered with 9 x 9 squares, 4 small crosses being scribed on the corners of the central nine squares. These indicate the home territories of each player which are the three rows nearest to the player. The picture shows a modern pocket magnetic Sho-gi set from the author's collection. Some of the pieces upon entering enemy territory are 'promoted', if the player wishes, to a superior piece of a rank defined by the rules. Those pieces that can be promoted are noted in the follow descriptions. Silver General - moves one space diagonally or one space forwards. Promotion is to a Gold General. Honourable Horse - two spaces forward and one sideways only. Promotion is to a Gold General. Angle-going - like a bishop in Chess. Promotion is to a Dragon Horse which can move like a Jewelled King OR an Angle-going. Lance - forwards only any distance. Promotion is to a Gold General. Soldiers - one space forwards only. Promotion is to a Gold General. 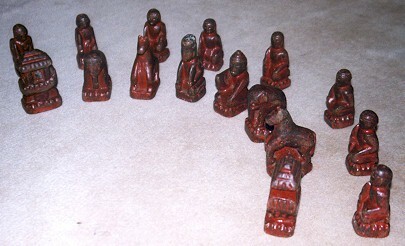 Sittuyin or Burmese Chess still bears the original horse and elephant pieces. Both boards and pieces tend to be large and robust. The game is not thought to be played much in Southern Burma anymore - unfortunately, modern European Chess is taking over. 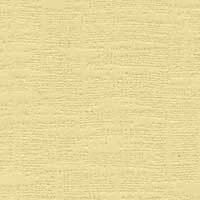 However, it can still be found in the tea houses of Upper Burma in the North West of the country. The game itself is unique for a variety of reasons, not least of which the starting position of the pieces which is variable, being at the discretion of the players and consequently providing a whole new element to the game. 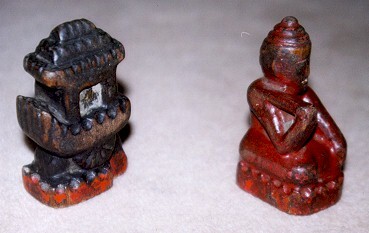 Pictured is a set of Burmese Chess pieces very kindly obtained for the author by his friend Maung Maung Thein of Rangoon. Chess in Korea, as can be seen from the picture, is similar to Chess in China. The board omits the river of Chinese Chess and some of the moves are slightly different but probably the most significant difference is that players can "pass" their go if they wish. One effect of this is to slightly increase the chances of a draw since when one player is reduced to a lone King, repeated passing forces a drawn game. Pieces are more commonly octagonal unlike those in this picture which is by kind permission of Paul Smith. Unlike Korean and Burmese Chess, Makruk or Thai Chess is presently thriving well in its home country where proponents outnumber those who play European Chess by a huge proportion and the game is a nationally televised attraction. 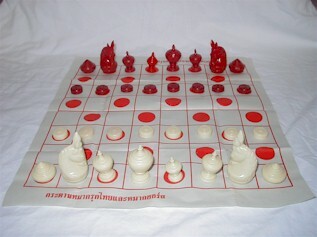 It is played in Cambodia as well as Thailand, although this country sports yet another historical variant - Cambodian Chess. The game is related to both the Japanese and Burmese versions of Chess and many people believe that Makruk predates both these other games. The attractive pieces are shaped like the Stupas or Thai temples that are found throughout Siam, as Thailand used to be called. In the past, pawns were often represented by cowrie shells, mouth down until promotion when they were turned upwards. The picture here shows a cheap plastic set bought from a Thai mail order shop. Chess in roughly the form of today appeared in in Southern Europe around the end of the 15th century and quickly became popular Europe wide. The powers of certain pieces were increased and new rules were added such as castling, two square pawn advance, and en passant. The most important changes turned the Fers into the most powerful piece of all, the Queen and the Alfil into the far-ranging Bishop by unrestricting it's power of diagonal movement. In 1749, Francois-Andre Danican Philidor, a composer and leading Chess player at the time, published 'L'analyse du jeu des Echecs' (Analysis of the game of chess). This is one of the greatest Chess works of literature ever written and has been translated into many languages since. Howard Staunton, the top player in the mid 19th century also wrote several important theoretical works and organised the first international chess tournament in London in 1851. This was won by Adolf Anderssen from Germany. In 1858, Paul Charles Morphy came to Europe from the USA and managed to take the mantle of best player at a very youthful age. To the left is a Chess set from the author's parent's collection which is thought to date from the turn of the century. The pieces are stored in a box shown on the right. 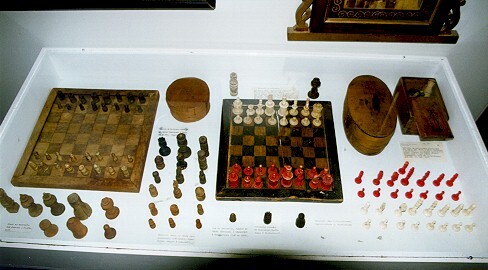 Above right - antique Icelandic Chess sets and pieces displayed in the Skogar Folk Museum, Southern Iceland. Dated to the 18th or 19th centuries, the pieces are mostly made of whalebone. The history of chess pieces is also a story worth telling. Until the mid 19th century, pieces tended to come as one of two extremes. The rich would display very ornate expensive decorate pieces with delicately crafted representations of kings, queens etc. which were often top-heavy and impractical while everyone else mostly used roughly hewn wooden lumps with only the height of the pieces to distinguish between them. 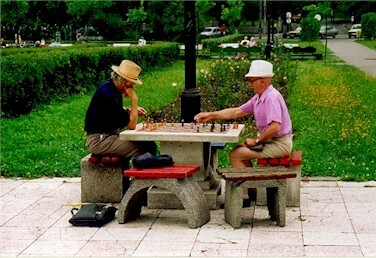 Middle left - two men play on public boards in a park in the centre of Brashov, Romania. In 1847, John Jaques of London created a new design which hit a happy medium between the two and was both practical and elegant. On the one hand, the pieces were easily distinguishable by easily recognisable symbols atop a pedestal - the King with a crown, the Queen with a coronet and the bishop by a mitre. The pawn is supposed to be a representation of the mason symbol for square and compasses while the piece de resistance, the knight, is an copy of the horse cut into the Elgin marble in Italy. On the other hand, by using different heights of pedestal, the useful idea of representation by height was retained. Howard Staunton apparently immediately realised the overall benefit of such a new design and lent his name to the new pieces which were duly launched in 1849. These Staunton pieces were immediately popular and soon became all the rage. At the end of the century, the design had evolved slightly - the protruberances of certain pieces were reduced or made more robust to prevent breakages and enable easier mass production. The newly released 1890 design quickly became the de facto standard for Chess all over the world and it has stayed that way ever since. Jaques of London, uniquely, are still owned and run by the Jaques family and their Staunton sets are still used worldwide by most National Chess organisations and tournaments. They also produce expensive hand made replicas of their original 1847 and 1890 chess sets - for more information see Buying Historical Chess sets. Right - the Lewis Chessmen on display in the British Museum, London. 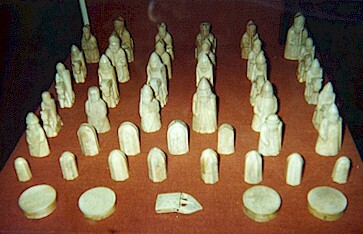 78 of these chessmen were found by a peasant in a stone chamber on the Island of Lewis in the Northern Hebrides in 1831. They are believed to have been carved between 1150 and 1170 AD - the most complete set of ancient chessmen in existence today. Replica Lewis chessmen are produced by a number of manufacturers - see Buying Historical Chess sets. 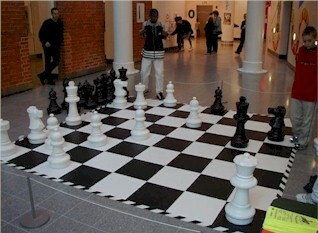 Left - Giant Chess being played at the Croydon Clock Tower, South London as part of their Board Games Exhibition in 2000. Giant Chess sets can be obtained from Masters Games. Computer programs which can play Chess were first written in the 1960's but these were easily beaten. Since then Chess programs have become increasingly better at the game and can now beat all but the best Grand Masters. In 1997, history was made when Deep Blue 2, a machine running the best Chess program yet written, managed to beat Kasparov, the undisputed best player in the world at the time. Masters Games sells the current Jaques Staunton tournament pieces as well as historical Jaques replicas made from the original patterns. Replica Lewis Chessmen are available too. Additionally, Masters Games sells Giant Chess sets which are great fun - ideal for the garden or for public entertainment. The Chess Page gives a history of chess and some links - not disimilar to this page. The Chess Variants Page is thoroughly recommended.